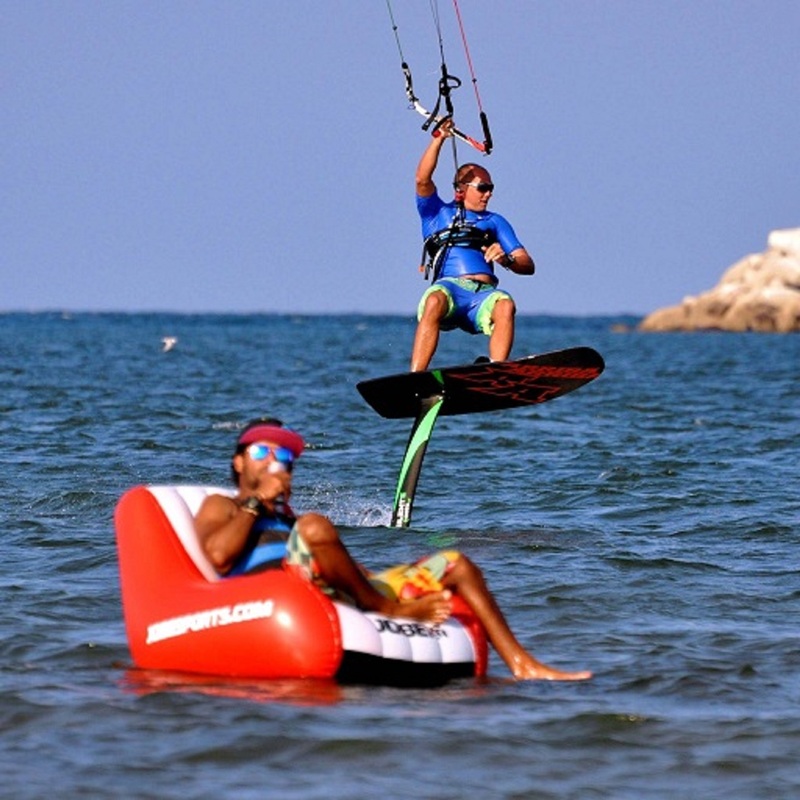 Hydrofoil and Race Kiting is a new trend in kite sport. Because of the extra-long fins of the race board or the wing of the hydrofoil, the board is being lifted out of the water and the friction between the bottom of the board and the water surface will be eliminated. This in combination with a high-performance kite makes it possible to kite even at only 5,5 to 6 knots. It takes some kiteboarding skills but with hydrofoil and race kites, you will be able to kite at days with low wind, when conventional kites, even large twintips, do not allow you to go on the water. Also the velocity on the water in relation to the wind direction can be much higher and you can go upwind on a much wider angle. Because of these advantages, hydrofoiling and race kiting becomes more and more popular. To begin with these new disciplines is not easy and especially hydrofoiling is a bit dangerous in the beginning because of the long and sharp carbon wing. This is why we offer you beginners courses in hydrofoiling and race kiting, so you can start easily and have fun. We provide the best material from FLYSURFER-Kiteboarding and MOSES-Hydrofoil. If you want to begin with hydrofoiling or race kiting, a solid ability to kite at at least VDWS-Level 6 ist required. The 6 hours beginners course costs 169,- OMR per person and includes best performing equipment of FLYSURFER and MOSES Hydrofoil during the course.